Meet the Main Cast of Attack on Titan Live Action Movie! Unless you've been living under a rock, it is hard to miss the highly anticipated movie adaptation of the 2013 breakout anime series Attack on Titan. Let’s get a closer look at the cast members who played the main characters! 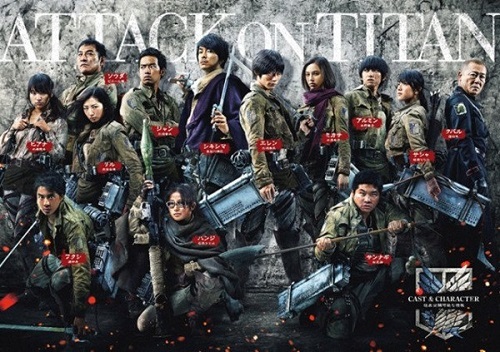 The Attack on Titan live action movie features most of the familiar characters from the manga and anime series Shingeki no Kyojin. It centers on the same old story about the members of the Survey Corps fighting against man-eating giants. However, the setting is changed from Germany to Japan with Caucasian characters portrayed by a Japanese cast. According to the manga creator Isayama Hajime, they selected actors capable of embodying the spirit of their characters. 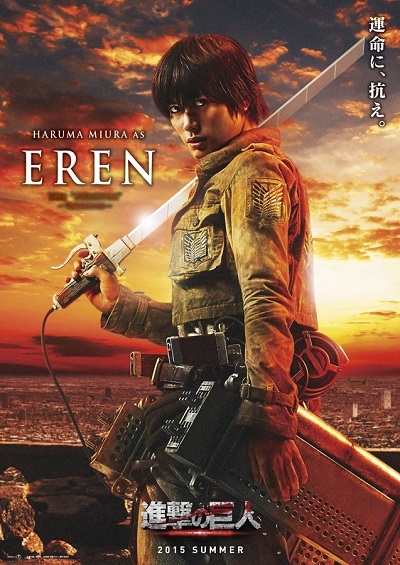 In the live action film adaptation, the main protagonist Eren Yeager is played by Haruma Miura. The 25-year-old actor and singer has previously appeared in several film adaptations such as the romantic drama Kimi ni Todoke, action movie Crows Zero II and highschool-thriller Bloody Monday. Outside of acting, he is also part of the currently inactive music group, the Brash Brats. Miura was a huge fan of the series before he was able to join the live action cast of Attack on Titan. 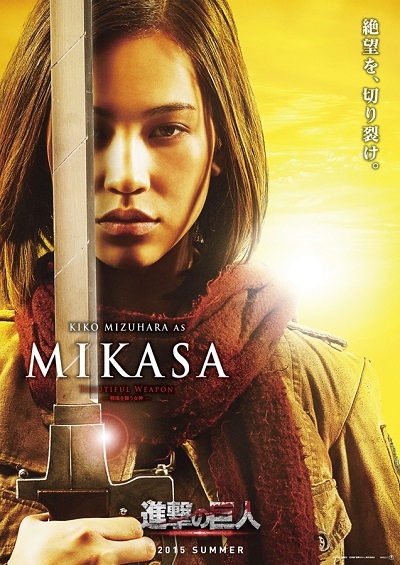 Mikasa Ackerman, a skillful fighter trying to save humanity from carnivorous giants, is portrayed by 25-year-old Japanese actress and model Kiko Mizuhara. Born and raised in Japan, she is ethnically half white American and half Zainichi Korean (the population of long-term Korean residents in Japan) She is one of the most popular celebrities in Japan, known for her roles in films and shows such as Nobunaga Concerto, Shitsuren Chocolatier and Norwegian Wood. She trained for 2 months, sometimes up to eight hours a day, in order to be able to portray Mikasa in the movie. Many Japanese fans have been anxious to see famous Japanese actor Hongo Kanata as Armin Arlert, a childhood friend of Eren and Mikasa. Although he is just 24 years old, Hongo has already starred in numerous live action movies such as Prince of Tennis and Nana 2. 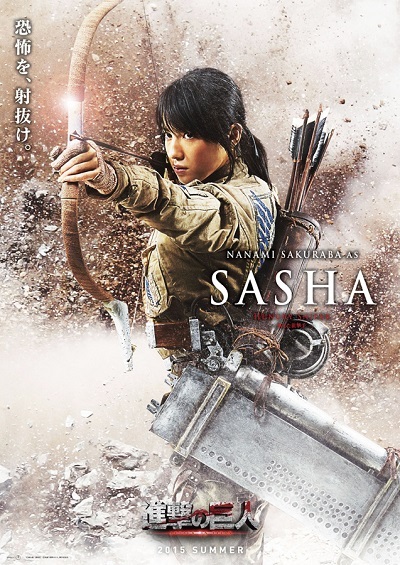 The potato-loving, sausage-stealing character Sasha Blouse, is portrayed in the live action movie by Sakuraba Nanami. Apart from her acting career, 23-year-old actress works as a gravure idol and member of the Japanese pop group bump.y. Costar Mizuhara Kiko mentions that Sakuraba is perhaps the most similar to her character out of all the live action cast members. Ishihara Satomi, known as Satomi-chan because of her cute personality, joins the cast playing Hans (Zoe Hange), the veteran member of the Survey Corps. Starting her acting career at a very young age, Satomi-chan has appeared in several dramas such as My Grandpa and Kita no Zeronen as well as in on-stage productions. She portrays Zoe's eccentric enthusiasm very well. 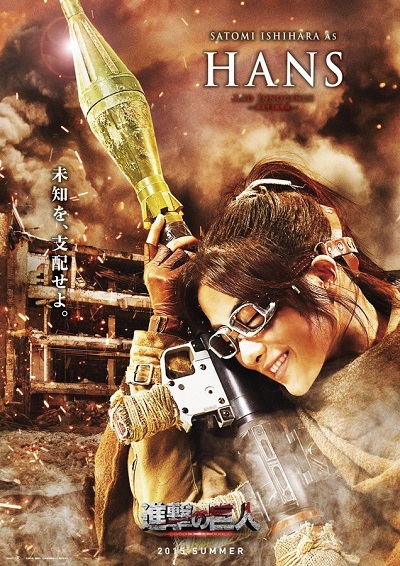 In a move surprising for the manga fans, she was portrayed in promotional posters for the movie holding an RPG, in a setting that is similar to the European Middle Ages. 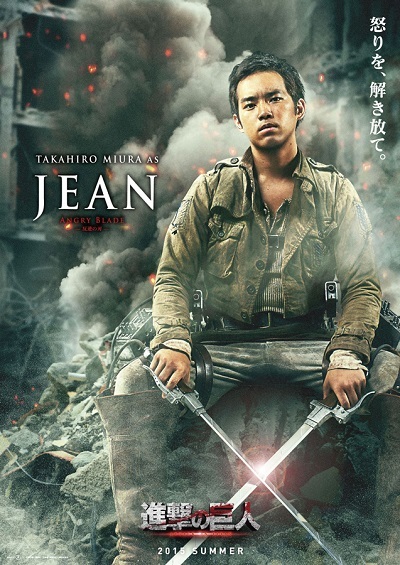 The spirit of the conflicted Jean Kirstein, a member of the Survey Corps, is embodied by 29-year-old actor Miura Takahiro. His most prominent roles are portrayals of Takeda in Eien no Zero and Yuma Kubozuka in Tantei no Tantei. In addition to the familiar faces, the film adaptation offers several new characters as part of the cast– Fukushi (Shu Watanabe), Hiana (Ayame Misaki), Sannagi (Satoru Matsuo), Lil (Rina Takeda), Kubal (Jun Kunimura) and Souda (Pierre Taki). 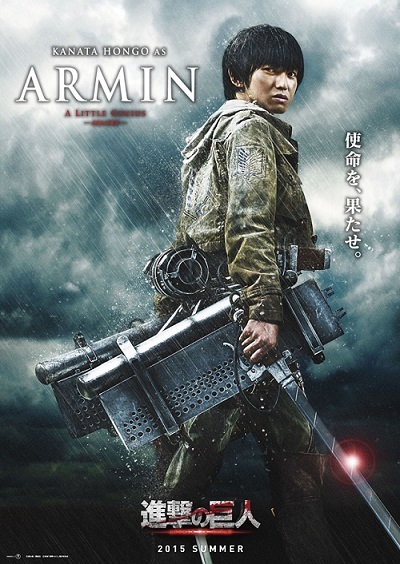 However, the supremely cool titan slayer Captain Levi has been excluded from the list of movie characters and replaced by newcomer Shikishima (Hiroki Hasegawa), known as the world’s strongest man.